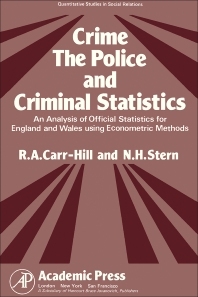 Crime, The Police and Criminal Statistics: An Analysis of Official Statistics for England and Wales Using Econometric Methods presents a study of the relation between official criminal statistics and the activities which they are supposed to reflect. The book is comprised of three sections: the theoretical background, the empirical argument, and certain implications of the study. The first section discusses the criminological, sociological, and economic theories under consideration in the light of available evidence, and their relevance to the countries and period of the study: England and Wales in the 1960s. The second section describes the techniques employed and the interpretations of the obtained results. The final section considers the examination of the use of official criminal statistics in discussions of policy; and the review of models of suitable or optimum strategies of punishment and deterrence. The monograph will be of interest to criminologists, economists, sociologists, and statisticians.